The Gemological Institute of America is publicly disclosing the names of the 19 companies it says submitted diamonds that received altered grading reports due to unauthorized remote access of its computer system. The companies can no longer submit stones to the lab, pending further investigation by Indian police. A statement says that Indian authorities have also arrested two former employees of Tata Consultancy Services, the GIA’s systems provider, in the investigation. GIA said it did not know what they are charged with. Tata did not respond to a request for comment. The discovery of the unauthorized access has led GIA to invalidate 1,042 grading reports. Their report numbers, along with the submitting companies, can be seen here. GIA decided to release the names after “police informed GIA that the investigation has reached a point where we may now publish the client accounts that submitted the diamonds in question,” according to a statement. GIA’s spreadsheet lists 19 submitting companies, mostly based in India, though at least one looks to be based in Hong Kong. Most of the clients submitted dozens of diamonds; three listed names submitted only one. At least two seem to share common ownership. The spreadsheet lists the stones’ report numbers, carat weights, and shapes. It does not list their color and clarity, as they have may have been altered. Several of the diamonds can be found online. For instance, Googling GIA report 1208363128—a 1.43 ct. round brilliant—leads to several online diamond listings, most of which have been removed. Here is an online scan of one invalidated report (5203571257), which says the accompanying a 1.06 ct. stone has been graded D internally flawless. GIA “strongly request[s]” that anyone in possession of any of these diamonds and grading reports return them immediately to GIA for examination at no charge. At press time, it could not say how many of the 1,042 affected reports or diamonds have been returned. Add Computer Hacking To The List! There are many diamond and jewelry companies that are willing to make easier sales and extra profits by cheating. Both the consumer and the ethical companies in these industries must contend with all sorts of attempts to deceive or cheat. Now we have to deal with computer hacking on top of overgraded certificates, the application of substances that temporarily improve color, synthetic diamonds and so on. On October 23, 2015 the Jewelers Circular Keystone reported by its online service that the GIA reported that their diamond grading report database was hacked. GIA has invalidated 1,042 diamond reports as the grades on those reports were changed through computer hacking. Here is the article. Included is a link to a list of the affected reports. If any consumer finds their diamond included in this list then GIA requests that the diamond and grading report be sent to GIA. Anyone in this situation may contact us for assistance in doing this. 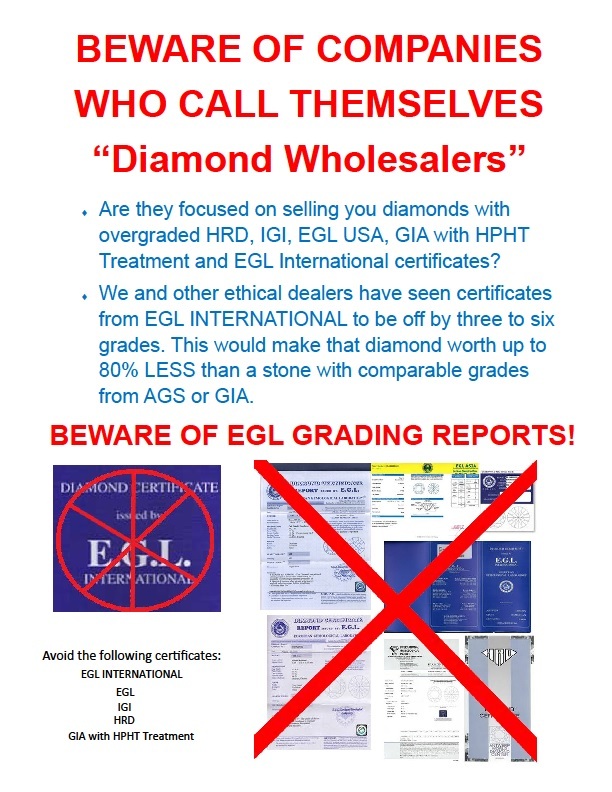 The Gemological Institute of America has invalidated 1,042 grading reports issued by its grading lab, as they bear grades that were altered after its system was accessed without authorization by former employees of its database support contractor, Tata Consultancy Services (TCS). The list of affected reports can be seen here. GIA requests that anyone with these reports or their accompanying diamonds return them to its lab for inspection. Entering their numbers into Report Check will show that the reports have been invalidated. The affected diamonds were mostly submitted in India, though some also came into GIA’s Carlsbad, Calif., headquarters. The stones were graded in whole or in part at various GIA locations, including its U.S. and India labs. The diamonds were submitted between November 2014 and September 2015; approximately 900 were submitted in July and August. The issue was caught when the lab flagged certain grading discrepancies through its internal controls. It subsequently launched an investigation in conjunction with TCS. The investigation revealed that one or more former TCS employees gained remote access to the system and made unauthorized changes to specific grades on behalf of certain parties. The clients who submitted the diamonds in question have been contacted and suspended from subsequent submissions to GIA pending further investigation. The unauthorized changes involved both color and clarity grades, says spokesperson Stephen Morisseau. GIA and TCS have made the results of their investigation known to law enforcement agencies in India, and they are actively investigating the matter, a statement said, adding that the incident has led GIA to strengthen its controls. In his latest Diamond Intelligence Briefings, Chaim Even-Zohar recounts the discovery and the documented reversal of a treated diamond, upgrading the stone temporarily by several grades, discovered at the Antwerp IGI lab in November last year. According to the IGI lab, the reversal process - through acid boiling -, which was witnessed and documented in an affidavit, revealed the diamonds were treated with a coating, temporarily upgrading the color grade of a 3.03ct diamond four grades, from J to G+ color. The precise nature of the coating, which may involve an very thin film visible only at 500 times magnification, is unknown. The article adds that the treated diamonds IGI discovered do not come from the same source(s) as the treated diamonds that were discovered by the GIA recently. IGI reportedly informed relevant trade bodies after the discovery to let them decide on taking disciplinary actions, but according to Even-Zohar, they kept silent. Carlsbad, Calif.--The Gemological Institute of America has cut off four clients traced to hundreds of diamonds submitted with an undisclosed treatment that improves their color by as much as three grades but fades over time. The vast majority of the stones are 1 carat or larger, with a number of 3-, 4- and even 5-carat stones in the mix. A three color-grade jump for stones of this size would amount to a big difference in price or, as one industry player observed, “big bucks” for the sellers. Meanwhile, the GIA has terminated the client agreements of the companies linked to the stones, as the lab “reasonably suspects” that the companies knew the diamonds were treated and did not disclose it, GIA spokesman Stephen Morisseau said. The companies are listed online as: E.G.S.D Diamonds Ltd., L.Y.E Diamonds Ltd., Abramov Romok and Yair Matatov. None of the four companies could be reached at the phone numbers listed online for them, all 972-54-397 numbers, mobile phones on the Israel Diamond Exchange’s cell phone system. Only one of the four, Romok Abramov, replied to request for comment on the case via email. In his email, he claims that “the amount of stones (that) can be submitted to GIA by one account is limited,” and so “Gabi” at E.G.S.D Diamonds, who presumably had hit his limit, asked him to submit stones on his behalf. “(I) never saw any of those stones and don’t have any idea if they were treated,” Abramov stated. The GIA confirmed that there are indeed stone submission limits at its lab in Ramat Gan. And Morisseau said the lab does have a procedure whereby clients can ask for another client to submit stones on their behalf, but he doesn’t know if that procedure was followed in this case. The lab became aware of this potentially new color treatment when a client (not one of the four listed above) purchased one of these diamonds and the treatment began to wear off, leaving him with a diamond that had a much lower color grade than what he had paid for. He returned the stone to GIA for reexamination. It was then that the GIA discovered the treatment and connected this stone with hundreds of others that had been submitted by the four companies. While the GIA hasn’t drawn any solid conclusions yet, Morisseau said they “reasonably believe” that all of the approximately 500 stones have been treated but won’t be able to say definitively until the lab reexamines them. He added that they are monitoring other GIA labs worldwide for similar submissions. The report numbers of the potentially treated stones are posted on GIA.edu. Anyone who has purchased or has access to any of these diamond is asked to submit them to any GIA lab for free, expedited review. BEWARE OF FAKE "DIAMOND WHOLESALERS"